With the high rate of turnover in the TV news business, KBOI-TV’s Jennifer McGraw can get a partial pass for not knowing, but when she got caught wading in the spring runoff in her cute plastic boots she won the first DOPE REPORTER award of the water year. Not only did she appear on air standing in the water, she even posted a picture of her boots on her Twitter page! The caption said, “Guess what? spring has sprung and the greenbelt is flooding. 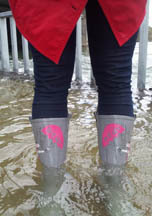 Even with my boots the water is too deep.” Which begs the question, was it an inch, a foot, or a yard over your boots? If she had stayed on high ground, boots wouldn’t be needed. As usual, the GUARDIAN will present DOPE REPORTER awards to reporters who appear on camera standing in flood water. Boots are permitted to get a good camera angle, but wading in water is for children on their way to school. Note to Jennifer: Check past DOPE REPORTER awards and you will see it isn’t personal and really is all in good fun. Reader nominations accepted at the CONTACT button on the home page. Note to Jennifer… the barricades that say “greenbelt is closed due to flooding” happen about every year. Maybe next time just get a picture of the barricades…..? EDITOR NOTE–Porc, is this what you mean? What’s the big deal, It’s not like the kids are watching and nobody ever drowns around here in the rivers or canals. It really looks like fun and I bet we can 4×4 in it too. Perhaps the award would be fitting if we had some sparking wires nearby. Perhaps you need to make a sign for the reporters about water hazards like you did for the rafters a few years ago. This is a story because…..? EDITOR NOTE–Because the water is over her boot…as seen on TV. I have to say the only thing worse would be all the Network Anchors flocking to a natural disaster v. just staying home. They add zero value to resolving the problems. I am thinking Fukushima, Hati, Katrina, and just about any hurricane off the SE coastline of the USA. Here is a picture of her without her pink boots( well I assume she is not wearing them). For variety, they oughtta ride a bicycle through the flooded spots on camera. Not FOX news so it’s a pack of elite liberal media lies! Not buying G-Man. Nomination to the general category of “Dope Reporter-Overall Excellence” goes to J Bates of the KBOI-TV morning show for condescending, snarky comments directed toward his co-anchor, weather guy and generally everyone other than himself. What is it about Channel 2 that makes its news productions so consistently 3rd (or 4th) rate?